How one nonprofit is grounding education in a garden experience. The Edible Education Experience garden in full bloom at the Emeril Lagasse Foundation Kitchen House & Culinary Garden in Orlando. Photo credit: Paula Kennedy. Connecting students and the local community to a healthy lifestyle sometimes takes a hands-on approach. Edible Education Experience in Orlando, FL, brings people together for roll-up-your-sleeves gardening and seed-to-table cooking education. And it all happens in its newly built, one-of-a-kind facility called the Emeril Lagasse Foundation Kitchen House & Culinary Garden. Back in 2003, the seedling of a simple idea took root at Orlando Junior Academy (OJA) when parent Brad Jones helped a first grade teacher turn a grassy patch into a vegetable garden outside the classroom door. Once the project got the green light, Jones (a former accountant-turned-firefighter) began volunteering as garden coordinator, where he helped students plant, grow, and harvest fruit, vegetables, herbs, and even cotton. But now that kids were learning where food comes from, they yearned to know what to do with it. Enter Kevin Fonzo, Chef-Owner of K Restaurant in Orlando’s College Park neighborhood, and Sarah Cahill, certified raw food chef and holistic nutrition coach. These two local chefs picked up where the harvest left off by volunteering to teach weekly cooking classes to OJA’s 5th-8th graders. Using the garden’s bounty, the chefs brought healthy cooking to life in a makeshift kitchen classroom lacking essentials such as hot water and a stove. As the garden expanded and cooking classes added, the “edible education” concept grew in complexity and popularity, with amazing results. The project has since blossomed into a full-blown, hands-on, integrated curriculum where teachers creatively cull lessons from science, math, history, and language arts through gardening and cooking. But with growth came some growing pains, as the cooking class once faced elimination. With generous funding from the Emeril Lagasse Foundation and Florida Hospital for Children, the garden-to-classroom concept evolved into a 501(c)3 public charity named Edible Education Experience. Chefs Emeril Lagasse, left, and Kevin Fonzo, right, at the grand opening of Orlando’s Emeril Lagasse Foundation Kitchen House & Culinary Garden. Photo credit: Jeffrey Onore. 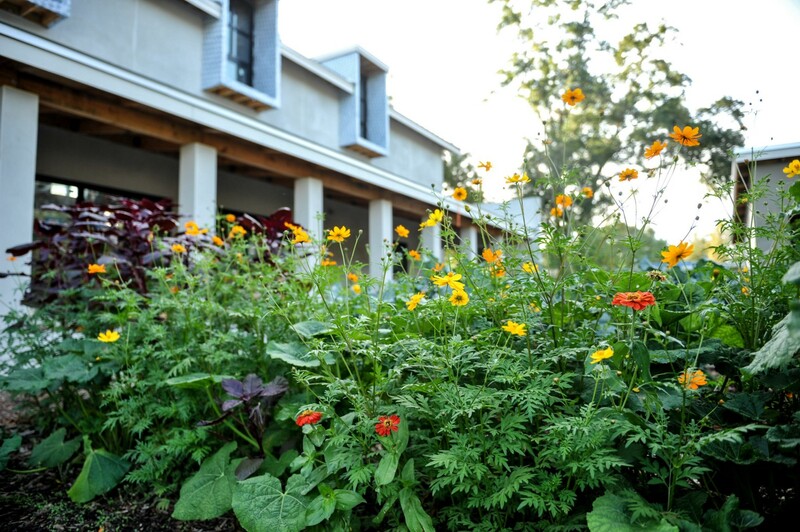 The Emeril Lagasse Foundation Kitchen House & Culinary Garden officially debuted in April 2017 as the new home where edible education takes place. Located across from OJA, the 3,500 sq. ft. Kitchen House features a commercial kitchen classroom with four hands-on cooking stations, including food prep and hand-washing sinks, two gas ovens, refrigerator, and freezer. Outside, a 1,000 sq. ft. garden yields crops to use in its edible education programs. With its new space, Edible Education Experience can serve more of the community through field trips, after school enrichment, summer camps, Chef Night, and community gardening. Plus, the nonprofit can expand its Teachers Academy where educators from around the country can learn how to start gardens and cooking classes in their own schools. Chef Kevin Fonzo and Chef Instructor Allyson Schurig (center) flanked by student chefs from Orlando Junior Academy. Photo credit: Paula Kennedy. What works here might be duplicated across the country, as the Emeril Lagasse Foundation looks to Edible Education Experience as a signature project. And this all grew from the seedling of a simple idea. It exemplifies what communities can accomplish when key partnerships work together toward a greater good.